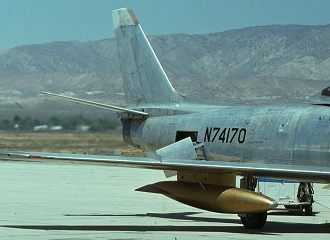 The F-86F had an uprated engine and larger "6–3" wing without leading edge slats, 2,239 built; North American model NA-172 (F-86F-1 through F-15 blocks), NA-176 (F-86F-20 and −25 blocks), NA-191 (F-86F-30 and −35 blocks), NA-193 (F-86F-26 block), NA-202 (F-86F-35 block), NA-227 (first two orders of F-86F-40 blocks comprising 280 aircraft that reverted to leading edge wing slats of an improved design), NA-231 (70 in third F-40 block order), NA-238 (110 in fourth F-40 block order), and NA-256 (120 in final F-40 block order); 300 additional airframes in this series assembled by Mitsubishi in Japan for Japanese Air Self-Defense Force. Sabre Fs had much improved high-speed agility, coupled with a higher landing speed of over 145 mph (233 km/h). The F-35 block had provisions for a new task: the nuclear tactical attack with one of the new small "nukes" ("second generation" nuclear ordnance). The F-40 had a new slatted wing, with a slight decrease of speed, but also a much better agility at high and low speed with a landing speed reduced to 124 mph (200 km/h). The USAF upgraded many of previous F versions to the F-40 standard. About 50 former Japan Self-Defense Forces (JASDF) F-86F airframes were converted to drones for use as targets by the U.S. Navy. In the US approximately 50 Sabres, many of them Canadair, are on the civil registry. 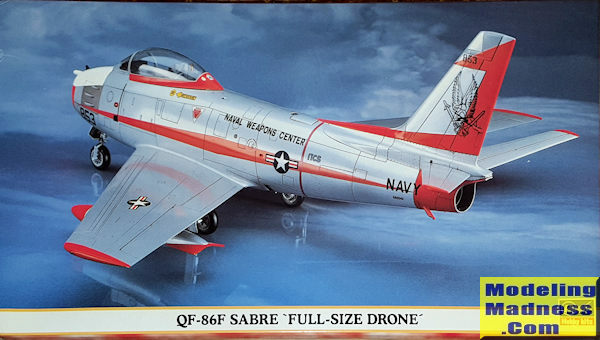 This particular kit is basically your F-86F-40 with a new set of decals. So you get a JASDF Sabre, complete with the longer wings and the various pylons for wing tanks and missiles or bombs. The cockpit is fairly nice with a seat cockpit tub, rudder pedals, instrument panel and control stick. A three piece pilot figure is supplied. Those not using the pilot may want to look for an aftermarket seat as the kit's is pretty basic. A full length intake trunk is provided and doubles as a place to fit the cockpit and the nose gear well. An engine compressor face is also provided for those with the skill to sand and fill the long seam on either side of the intake. A similar treatment is provided for the exhaust. Thankfully, Hasegawa includes both intake and exhaust covers. Five grams of nose weight is called out and this can fit atop the intake trunking forward of the cockpit. Throughout the construction, you are directed to open various holes. I'd not do the inner wing ones as the drones did not have inner pylons. They frequently did not have drop tanks either, so make your choice from photos. The wing is a lower section with separate upper halves. Though this is a slatted Sabre, the wings do not have separate slats. L anding gear are well done and the doors, though separate, could easily be modeled closed. Things under wings are a pair of fuel tanks and a pair of inner pylons for Sidewinders. As mentioned, the holes for the inner pylons should be left closed. A separate windscreen and canopy are provided to allow for the canopy to be modeled open. You also get separate speed brakes. These were frequently open to some degree from just cracked to fully deployed. Typical of most Sabre kits, the doors open straight out. This is incorrect as they have a decided downward droop when open. Note also that the camera fairing that projects from the nose is not included with the kit. 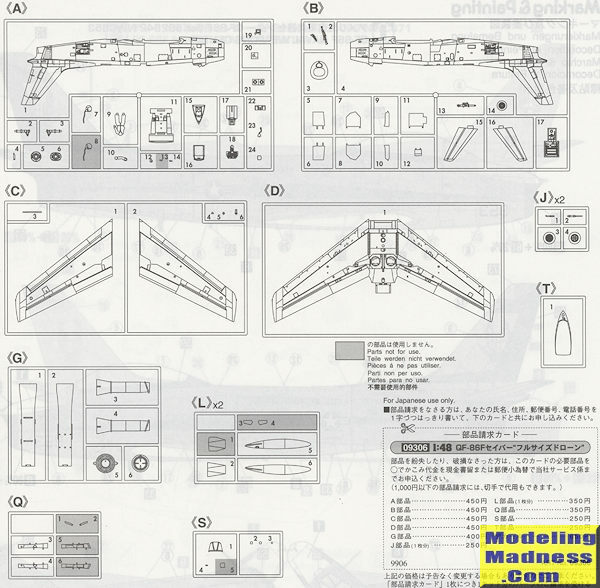 That will have to be made by the modeler and the instructions provide guidance in making and installing it. Unusual for a Hasegawa kit, this one has a build up on the box. This is, of course, one of the two options and like the other option, is in overall unpainted metal. The orange markings will need to be painted. These are the same as what the Blue Impulse display team wore though these are limited to the fuselage and fin. The other option has no color aside from the full color NWC markings on the fin. Even the insignia on this one are low visibility. The planes carry the JASDF serial or perhaps the Mitsubishi constructor number on the rear fuselage and the 'last three' on the nose. Decals are nicely done and provide minimal stencils. The Hasegawa Sabre is still considered by many to be the best kit of this plane in this scale. 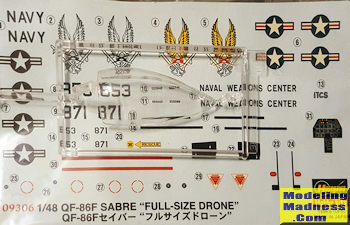 While the QF markings may not be inspiring to all, the kit can provide the basis for a number of planes from other nations that flew the long wing Sabre.